During the XXI century, the concepts of self-assembly and self-organization have flooded all branches of natural sciences, from biology to nanotechnology. Self-assembly consists in the emergence of a complex ordered organization in a thermodynamic equilibrium state starting from a disordered state. Self-assembly is widely found in nature (for example, a virus can self-assemble from its constituent elements), but also it is of great practical interest for an easy and reproducible bottom-up fabrication of materials from nanoscopic building blocks (molecules or nanoparticles). The self-assembly process requires the presence of noise (i.e., a thermal bath) and thus entropy plays an essential role. Self-organization is the formation of complex patterns and structures from a disordered state, which requires a nonequilibrium state (for example, a continuous supply of energy). Here, the rate of entropy production is a key quantity. Sometimes, similar complex structures can be obtained spontaneously from self-assembly or self-organization processes being the time scales (and maybe also the length scale) of the organization the only perceptible difference. Both processes are of key interest in science, but their quantitative prediction and understanding is still a challenge. Interestingly, thermodynamic and statistical mechanical models developed for particular problems teach us that many features involved in one system are also relevant in apparently unrelated systems (theories of surfactant self-assembly are relevant to magnetic particle self-assembly, for example). Thermodynamics in general and its central concept of entropy, in particular, emerge as key actors to quantitatively formulate and understand self-assembly and self-organization processes. I, therefore, solicit contributions to this Special Issue from the many aspects of self-assembly and self-organization from all branches of science that emphasize fundamental aspects. Entropy (ISSN 1099-4300; CODEN: ENTRFG) is an international and interdisciplinary peer-reviewed open access journal of entropy and information studies, published monthly online by MDPI. The International Society for Information Studies (IS4SI) is affiliated with Entropy and their members receive a discount on the article processing charge. High visibility: indexed by the Science Citation Index Expanded (Web of Science), MathSciNet (AMS), Inspec (IET), Scopus and other databases. Rapid publication: manuscripts are peer-reviewed and a first decision provided to authors approximately 19.1 days after submission; acceptance to publication is undertaken in 5 days (median values for papers published in this journal in the second half of 2018). Testimonials: See what our authors say about Entropy. 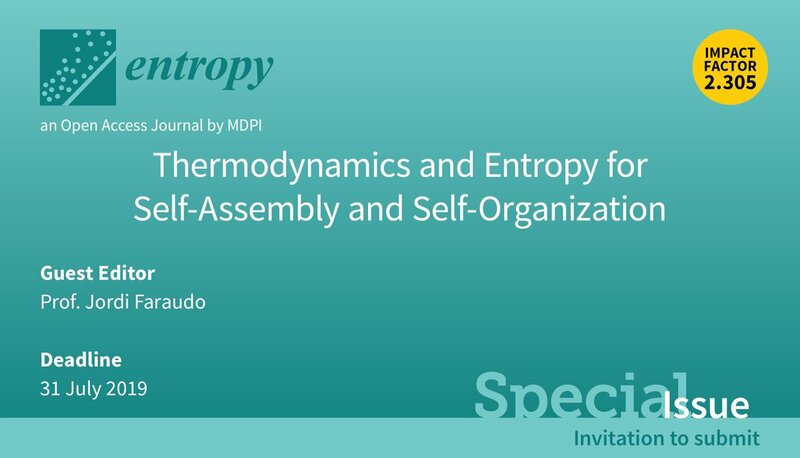 Special Issue "Thermodynamics and Entropy for Self-Assembly and Self-Organization "